Today we will talk about, of course, the best exercise for working out the triceps. We will talk about the French press and the variations of its performance. Perhaps you will also be interested in articles like pumping of trapezoids and what is pumping. The French press is an excellent isolation exercise for the triceps. In addition, we want to pay the separate attention to the word “isolation”. The fact is that while performing this movement, we have the opportunity to cheating, helping our triceps perform the necessary work. This can be both an advantage when the athlete Kris Gethin 12 week understands that he comes to the gym to build muscles, rather than self-esteem, and a disadvantage, if the athlete hung on the neck an unbearable weight and struggles to grip the heavy barbell. This can lead to injury of the elbow joint, which is one of the most fragile joints in our body. The fact is that the French press is exactly the exercise that allows you to maximize the use of the long head of the triceps. Namely, this part of the muscle, which occupies 70% of the human hand, is usually lagging behind and limits our progress in other basic exercises for the bodybuilder. The underdeveloped triceps limit the growth of pectorals, deltoids and biceps. Therefore, in order to have a harmoniously developed triceps, and in general, a large and embossed hand, the French press should be included in your training program without fail. Between all the isolation triceps exercises, the most popular is the French press with a barbell. It can be performed with a straight barbell and dumbbells, but the EZ-bar is the one that most people prefer because it lets you perform a movement that comes more natural to your elbow and wrist joints. The initial position: from a standing position, grasp an EZ-bar loaded with the desired weight and raise it above your head extending your arms. Palms face forward. Don’t bend your wrists. Slightly bend your knees to find a stable position. Keep your core tight. The movement: lower the bar behind your head, slowly, focusing on the movement. Then lift it again to the initial position. Keep your elbows high in the same position, don’t swing your arms. Lower and lift the bar in a semicircular arc behind your head. Breathing: inhale while you lower the bar, exhale while you lift it. A few tips on the technique: don’t raise the elbows during the movement, otherwise the triceps will turn off from work, and also try to start moving upwards only when your forearms touch the biceps. Prefer the EZ-bar when you perform the French press as it gives more comfort relieving pain in the wrists and lessening torque in the elbows. The most common variations of this triceps exercise is performing the movement in a seated or lying position, or use a straight barbell or dumbbells. Seated position: it is exactly the same of the standing position but it provides more balance and stability for obvious reasons. Especially if you use a back support. Lying position: this one deserves a little bit more explanation. It’s not as easy as just “rotating” the standing position of 90 degrees. 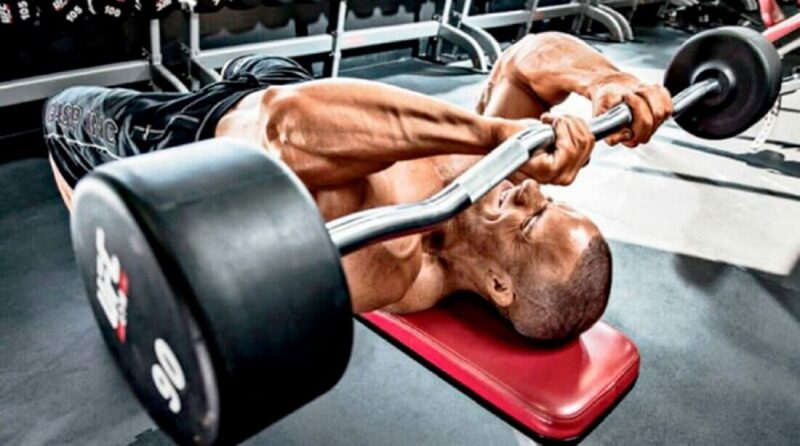 Once you lie on a flat bench your elbows point straight up (arms are vertical). You lower the bar behind your head keeping your elbows pointing up and the lift the bar again. You notice that when you lower the bar you can’t actually bring it behind your head without moving your elbows. Just go down as much as you can (probably just behind your forehead). 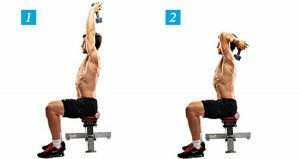 Dumbbells: just repeat the exercises described above with dumbbells. Try to keep the same orientation of your palms that you have when you perform the French press with EZ-bar. 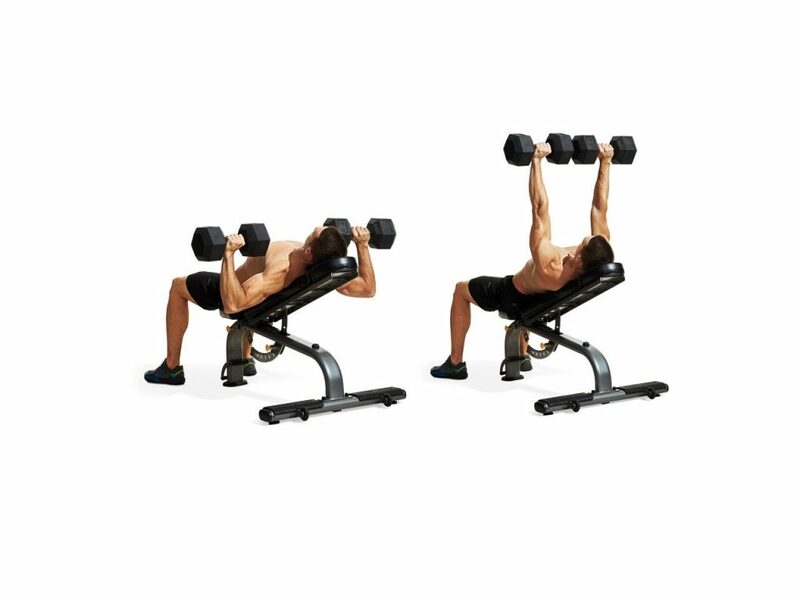 Also with dumbbells you can do the exercise standing, sitting or lying on a flat bench. Standing French press with dumbbells is an exercise that can both lead to the development of disproportion and eliminate it. Another advantage of this variation of “The Frenchman” is that it is great for beginners, as well as for people whose triceps are lagging behind. For example, this muscle lags behind in many people. And 20 kilograms in the French press, while maintaining the correct technique in the necessary number of approaches and repetitions for them is an unbearable burden. The best solution will be dumbbells and you should use them until you can lift even an empty barbell. By the way, we recommend reading how much the weight plates weight. When you’re prepared to press the barbell with weight plates, you can immediately break the stagnation in bench press. With the development of the triceps, the results will also go up in the remaining “triceps-containing” movements. And all thanks to the fact that at the initial stage you took a dumbbell in your hands. Incline French press is the most common variant of this exercise. Set up for the incline French press by loading the appropriate weight onto an EZ-Bar or barbell and sitting with your back flat against an incline bench. Grasp the bar with a close grip (just inside shoulder width) using an overhand grip (palms facing forward). Raise the bar straight above your head until your arms are nearly fully extended (keep a slight bend in your elbows). This is the starting position. Slowly lower the bar down behind you by bending at the elbows. The bar should come down as far as comfortably possible or when it is about even with your head. Slowly raise the bar back to the starting position. This is one rep.
Focus on moving the weight with your triceps, keeping control of the weight as you slowly lower and raise the bar. The least common variation of this exercise is to perform it with dumbbells. Again, the variation is effective either if you can not perform the exercise technically with the barbell, or when you eliminate the disproportion. However, this is one of the best exercises for the triceps, so fans of this particular variation won’t change their mind in the need to get off the bench and take up the barbell. Also pay attention to the rowing machine, which also works triceps out well. How to perform the French Press exercise correctly? This is one of those moves that can cause some serious damage if you attempt to lift a weight that is too heavy because it is not only quite close to your head, but also has the potential to pull your arms backwards. So always start off light and work your way up, regardless of whether you are using a dumbbell, EZ-bar or barbell to perform this French press exercise. If you want to get the most of this move, you should always use a narrow grip to place maximum emphasis on your triceps, and then press upwards with your arms. Everything else should be locked in place, i.e. your head, neck, shoulders and back. It is also important that you try not to relax your elbows and allow them to flare outwards. This move can easily cause elbow pain if it is performed badly, so you really want to keep your elbows tucked in and facing forwards to reduce the risk of injury. As with any kind of arm exercise, it is never a good idea to fully extend your arms as far as possible when performing this move because this will place a lot of strain on your elbows, and could easily result in an injury. You should always pay attention to what you are doing and focus on the movement when doing the French press, because if your form starts to suffer, or you start to run out of strength, for example, you could easily drop the weight on your head. So aim to do a certain number of reps by all means, but always know when to stop. At the end of training. And this is very important! As we already noted above, the exercise is quite traumatic. That is, if at the beginning of the training we can take a lot of weight and try to perform a French bench press with cheating, loading not so much the triceps as the elbow joint, then at the end of the training, after the bench press, bars, swings, push-ups and so on, we don’t have such an opportunity. Therefore, we perform the French press only at the end of the workout. The progression of loads is the principle without which your triceps will not grow even if you use all of the above variations of this movement. However, we will deliberately focus on the progression of loads in this exercise, since it differs somewhat from the scheme of progress in other exercises. It is necessary to be extremely careful about the new kilograms on the barbell. It is advisable to reduce the steps of progress even to 1-2.5 kilograms. In doing so, better perform the exercise in a multi-approach (5-7 sets) in a high number of repetitions (12-30 reps – the norm for the French press). So, we reach up to 20 repetitions in 7 approaches and add extra kilograms – two, after which we reach the same marks and add kilograms to the barbell again. 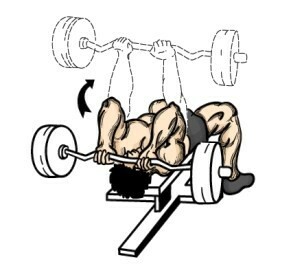 French bench press is the most effective exercise in the building of the triceps. Bench presses, parallel bar dips and other movements that include the triceps in performance are inferior to the French press. And if you take into account the fact that “The Frenchman” is an isolation exercise, you can pull up the triceps separately from the pectorals and deltoids. What is most interesting, the growth of the triceps is noticeable after the first training. In particular, this is relevant for those who made a big emphasis on basic work, not using isolation exercises. 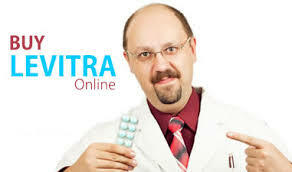 Firstly, you will see the result in the mirror and on the centimeter. Secondly, the result will manifest itself in the form of improved results in basic exercises, such as the classic bench press. And this is an occasion to ponder for those who do not have a relationship with the progression of loads in the classic press. Perhaps the problem is in the triceps, which need to be tightened.